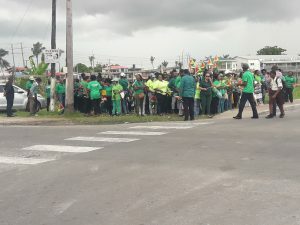 APNU candidates for Georgetown’s City Council and supporters on Woolford Avenue as they prepared to submit their nominees to the Guyana Elections Commission’s Returning Office at Critchlow Labour College. A Partnership for National Unity’s (APNU) Akeem Peter on Friday apologised for the failure of the outgoing Georgetown City Council’s to satisfy many demands by citizenry. “We must apologise for not reaching the expectations of people but what we must say also – we reached something that was there for decades and it’s quite unfair to fix it in two years and we’ll continue to fix it once we are elected again,” he said in clear reference to the failure to hold local government elections for 23 years until 2016. The maintenance of roads, drainage infrastructure, the cemetery, markets, timely collection of garbage and other public goods in the City have been less than satisfactory. Peter said the candidates for Georgetown are “a lot of new faces” in almost all of the constituencies whose agenda is to develop healthier, safer, stronger and cohesive communities. “Young people came up to represent their constituencies and the party believes in young people and believes in youth and the party decided to give the young persons to lead those constituencies along with the persons serving there before because we understand that experience is important,” he said. Told that APNU has been overshadowed by the controversial parking meter project between City Hall and Smart City Solutions, non-payment of salaries and failure to remit income tax, social security and credit union deductions, Peter was asked why should Georgetown residents vote for that umbrella five-party organisation given its credibility. “We will continue to build our credibility…We have entered the governmental arena in 2015 at central government and we will continue to strive towards building that credibility and building confidence into the people,” she said. Peter promised that if APNU commands a majority in the Georgetown City Council at the November 12 local government elections, the elected body would strive to improve drainage, financial management, and management of individual constituencies. While incumbent Mayor, Patricia Chase-Green was very prominent in the procession that entered Critchlow Labour College, there were several huge placards featuring Peter. 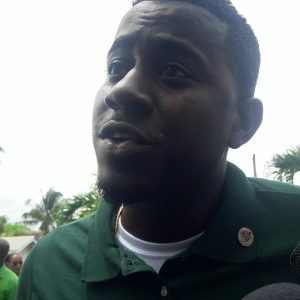 The People’s National Congress (PNC)-d0minated APNU will eventually decide whether Chase-Green would be returned as Mayor or if Peter or another candidate would be elected from around the Council’s horseshoe table. However, much depends on whether APNU gains an outright majority or a plurality which would require support from one of the other contesting parties or independent candidates.